Takeaway: Channel your warrior energy to achieve mental strength and energize your body by adding warrior two to your daily yoga practice. Once you’ve been practicing yoga for a while, you may discover that there are certain poses that become your “go to” asanas for when you need to feel a particular way. For me, I love child’s pose when I need to rest and feel nurtured, and camel pose to re-energize after long periods of writing. But my favorite asana for feeling powerful is warrior two pose. Warrior two is a pose where you are simultaneously grounded, centered and open. Both feet are firmly rooted into the ground, connecting you with the earth. Your torso is centered directly above your stance, neither leaning forward racing into the future or pulling you back into the past. Your posture reflects your presence, right here in the moment. You stand in your strength. When viewed from the front, your outline is knife-like and razor sharp yet your body remains powerfully expanded. Your hips open to the side and you spread your arms, fully inhabiting the space around you. Here's more information on this powerful pose and how to cultivate its power in your practice. The mythical background of warrior two and all the warrior poses brings a whole new dimension to its power. 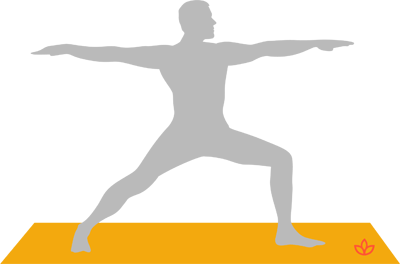 The Sanskrit name for warrior pose is Virabhadrasana. The poses take their name from the fierce warrior, Virabhadra. The story of his birth lies in his relationship with the Hindu god, Shiva. Shiva’s beloved wife, Parvati, fell out of favor with her priest father, Daksha. Unwilling to take his insults any longer, she disowned the body he had given her by throwing herself into the fire. Distraught on learning of his wife’s tragic death, Shiva incarnated Virabhadra from a lock of his own hair and tasked him with destroying Daksha. He gave his warrior creation the name Virabhadra, which comes from the root words, vira, meaning “hero,” and bhadra, meaning “friend." Virabhadra was a warrior of exceptional power and physical prowess, combined with an equally fierce loyalty to his creator, Shiva. By practicing warrior two, we connect with part of Virabhadra’s story and energy. Warrior two symbolizes Virabhadra setting his opponent in his sights and taking aim. Likewise, it helps us to connect with his warrior-like focus, conviction and fearlessness. Warrior two is a demanding pose for the legs and lower body. As the front knee bends and the thigh comes parallel with the ground, the leg muscles need to work to support you. This helps strengthen them, building a powerful foundation for your whole body. At the same time, you press firmly down into the back foot, engage your core and firm the arms. These actions spread energy and power throughout your whole body. Holding warrior two for an extended period of time builds physical strength and stamina, but it also builds mental strength. You learn how to hold a physically demanding pose while remaining internally struggle-free, cultivating a sense of sukha (ease). Warrior two can be a pose which you use to set any of your goals in your sights, standing firmly in your power as you aim for what you want. One method to amplify the power of warrior two is by visualization. Visualize whatever you want to achieve on the end of your front middle finger and fix your gaze on this as you hold the pose. A fun variation of this is to visualize your highest, most authentic self - the person you know you can be at your best - in miniature and sitting on that finger. Hold this image in your mind's eye as you feel the power of the asana working its magic, helping you to reach your innate potential. Warrior two is a powerful pose that connects you with your own spiritual power. In the myth, Shiva is said to represent the higher Self, while the misguided Daksha represents the ego. Thus, Virabhadra is the means by which the ego is destroyed for the sake of the Supreme Self. Some think of Virabhadra as the embodiment of the spiritual power of action. By invoking your inner spiritual warrior, you can prepare to battle your own ignorance and suffering. Practicing warrior two will give you the strength and focus to find freedom and liberation.